We try our best to eat healthy and monitor how many sweets we eat in a week. However, there are some times where the craving is too strong, and we have to give in before we start binge eating for a month. You can go for that double fudge triple chocolate cake with ice cream, but it’s better to take something that’s already healthy, ruin it with sugar just a little bit, and then you won’t have 40 times the amount of calories and sugar intake to deal with. The best thing to dress up for a sweet snack is fruit, as it is inherently sweet (for the most part) already. Berries covered in cream or bananas with some sort of sweet deal are always good options, which is why they often end up on ice cream. 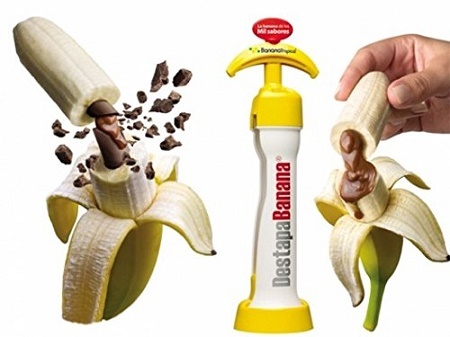 If you prefer bananas, and just want to smother them in Nutella or peanut butter, then you’ll want the Destapa Banana Stuffer. This will certainly take away the sweet craving, but won’t completely overload you. Of course, if you’re going to spend upwards of $25 on something, you might as well use it for more than just chocolate. This will clear the way for whipped cream, yoghurt, applesauce, chocolate wafer sticks and more. This is sort of a one trick pony in what it can do, but it will give you the ability to change it up whenever you feel like it.